HP continues to stumble towards its pre-planned split in November after its earnings fell short of estimates once again. Revenues plunged across almost all of its divisions in the fiscal third quarter with PCs, services, printers and software all being bitten by the global slowdown in the personal computing sector. 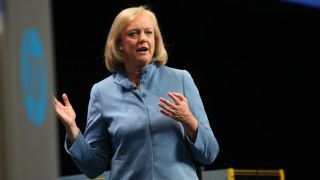 "We faced a challenging macroeconomic and IT spending environment in the quarter," CEO Meg Whitman confirmed. The raw figures showed that PC shipments dropped 9.5% in Q3 with net income for the company down 13% to $854 million (around £544 million, or AU$1.1 billion), revenues dropping 8.1% to $25.3 billion (around £16.1 billion, or AU$34 billion) and it all meaning that sales have now declined in 15 of the last 16 quarters for HP. That drop in revenues was reflected by a 13% drop in PC revenues, 8.6% decrease in printer revenues and services revenues, which are though to be a crucial part of HP Inc post split, dropped off by 11%. The Enterprise Group that includes servers and networking saw revenues edge up by 2%, one of the only bright spots for the firm. Success on the enterprise side of things is not unexpected given that most people consider the Hewlett-Packard Enterprise company to be far more valuable going forwards than the other half of the split HP Inc. The split as a whole is going to cost some $2 billion (around £1.27 billion, or AU$2.72 billion) in costs, charges and taxes, Whitman admitting in May that this will be "divided equally between the two companies." Bloomberg added in that the company may be forced to cut even more jobs as part of a plan to remove 55,000 positions that has already been announced and most of those working at the firm will have being looking on with baited breath ahead of the split.